We hear so much about presidential candidates–and so little about life in the states that elect them. In “Beyond the Circus,” writers take us off the trail and give us glimpses of politically important places. Today, Michigan. When people used to walk the streets of my hometown of Detroit, they knew exactly where they were. They were in Hitsville, the home of Motown Records. They were in the Motor City, the auto capital that put the world on wheels. They were in union country, a workingman’s paradise, one of the ventricles of the nation’s industrial heart. We ain’t that no more. Ain’t been it for a long, long time, to be frank–so long, in fact, that I don’t think I ever knew that Detroit. Sure, like a lot of kids here in the ’70s, I grew up listening to the Temps and Marvin Gaye. But the “Motown Sound” was by then so much corporate ventriloquism. Berry Gordy had moved the label to Los Angeles in 1972. By the 1980s, the “Motown” and “Motor City” monikers seemed at best quaint and, at worst, laughable. As the world turned to Japanese manufacturers for efficient, quality cars, American carmakers embarrassed themselves with rolling jokes like the Dodge Shadow, the Chevy Cavalier, the Plymouth Caravelle, and the Cadillac Allante. The white flight that had begun in the 1950s accelerated in the ’70s and ’80s, turning metro Detroit into one of the most segregated regions in the country. Race-baiters like Oakland County Executive L. Brooks Patterson sold the city’s northern suburbs as a safe haven for whites who refused to be governed by Detroit’s new black political class. Department stores and other businesses followed, taking with them jobs and any hope of maintaining downtown Detroit as a retail center. The city’s tax base dwindled. Many of the black families whose patriarchs had moved “up South” to work the city’s auto plants, and who had become the cornerstones of a thriving middle class along the way, also began to leave–first in a trickle, and then, by the 2000s, in a deluge. 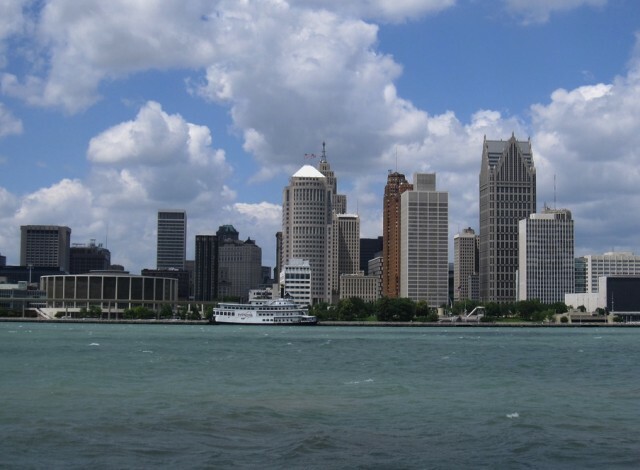 Once a city of nearly 2 million, Detroit today has a population of less than 800,000. The city has a $300-million budget deficit. The school system has been taken over by an equally inept, even hostile, state government. Yet when people talk about what it will take to bring Detroit back, many of them–from President Obama to local city councilmen–spend their time dwelling on its long-gone auto industry. While domestic manufacturing remains critical, and Detroit should be part of it, people need to let the city move on. We can’t keep thinking what’s good for GM is good for Detroit. Of course, this notion was never entirely true. The car companies encouraged the gutting of street-car systems and the expansion of local freeways that destroyed many of Detroit’s neighborhoods. But if it wasn’t entirely true in the past, it’s an outright falsehood today. Yes, General Motors maintains headquarters in downtown Detroit (the Obama administration almost demanded it), while Ford and Chrysler are headquartered in nearby suburbs. But only a couple of plants remain in the city proper and thus on Detroit property tax rolls, and fewer Detroiters than ever work in the auto industry. Certainly, these companies are important to the region and the rest of the country, but they cannot be the salvation of Detroit. Just last year, GM enjoyed its largest profit ever, $7.6 billion in revenue, but it meant little for conditions in the city. Unemployment remained sky-high. Residents kept moving away. GM has been booming the past year or so, but Detroit has continued its death spiral. Years ago, men with only high school educations–sometimes not even that–could earn wages comparable to those of many white-collar professionals. They worked hard and they thrived. That isn’t the reality anymore, but, in Detroit, too many people act as if nothing has changed. Higher learning still gets short shrift. Consider: Only about 11 percent of Detroit residents have college degrees, in contrast to about 25 percent of Americans nationally. How ridiculous is that? You’re afraid of cars that don’t pollute the air? Detroiters don’t need healthcare? Is that too soft, too liberal, for those of us who live in overworked industrial wastelands? No, that’s what you get when your identity as a Detroiter goes no further than the stereotype of an anti-intellectual meathead too busy putting together gas-guzzlers to care about the social contract. But it’s not just muddled pseudo-conservative illogic that’s the problem. Whenever President Obama pops into town, he seems to be concerned only with visiting car factories. I know, I know: It’s all about touting the success of the car bailout. But damn, man, take a trip around the rest of the city. See how the city’s once-vibrant eastside–where Chrysler’s Jefferson Avenue plant towers above vacant lots and ramshackle homes–is wasting away amid blight and violence. Look at how the enclave of Hamtramck teeters on the brink of bankruptcy despite GM’s Detroit/Hamtramck assembly plant. Take a look at the full picture, not just the shots with smokestacks in the background. If pols and others want Detroit to embrace a brighter future, they need to stop harping on the symbols of its past. Darrell Dawsey is a book author and freelance journalist who lives in metro Detroit. His work will appear on the soon-to-launch website Deadline Detroit. *Photo courtesy of Bernt Rostad.